“Competence” is a word that rolls off the tongues of instructional designers, education administrators, and HR people. Others find it hard to swallow. For some GIS&T educators, competence connotes an emphasis on vocational instruction that’s unworthy of the academy. This entry challenges skeptical educators to rethink competence not just as readiness for an occupation, but first and foremost as the readiness to live life to the fullest, and to contribute to a sustainable future. The entry considers the OECD’s “Key Competencies for a Successful Life and Well-Functioning Society,” as well as the specialized GIS&T competencies specified in the U.S. Department of Labor’s Geospatial Technology Competency Model. It presents findings of a survey in which 226 self-selected members of Esri’s Young Professionals Network observe that competencies related to the GTCM’s Software and App Development Segment were under-developed in their university studies. Looking ahead, in the context of an uncertain future in which, some say, many workers are at risk of “technological unemployment,” the entry considers which GIS&T competencies are likely to be of lasting value. DiBiase, D. (2018). Competence in GIS&T Knowledge Work. The Geographic Information Science & Technology Body of Knowledge (3rd Quarter 2018 Edition), John P. Wilson (Ed.). DOI:10.22224/gistbok/2018.3.10. This entry was first published on September 28, 2018. No earlier editions exist. Competency model: A collection of competencies that together define successful performance in a particular work setting. Knowledge work: Although consensus about the meaning of this term is elusive, it often connotes non-routine problem-solving that requires a combination of convergent, divergent, and creative thinking. Occupation: A category of jobs that require similar competencies and produce similar work products. Profession: One or more similar occupations that require advanced knowledge, specialized education and credentials, a commitment to a discipline-specific code of ethics, and a shared moral ideal. Technological unemployment: The loss of jobs caused by technological change, especially automation. The most holistic and rigorous effort to date to understand “competence” may have been the “Definition and Selection of Competencies: Theoretical and Conceptual Foundations” (DeSeCo) program of the Organization for Economic Cooperation and Development (OECD). Since its beginnings in 1948 as the organization that administered the Marshall Plan to rebuild Europe after World War II, OECD has evolved into an intergovernmental statistical agency and policy forum “committed to democracy and the market economy” (Wikipedia 2017). Beginning in 1997, with support from the U.S. National Center for Education Statistics and others, OECD charged the Swiss Federal Statistical Office to manage a series of studies, symposia, and scholarly publications intended to define the competencies needed for successful individual lives and a well-functioning society (OECD 2001). The final report and Executive Summary of the DeSeCo program defines “competency” as “more than just knowledge and skills. It involves the ability to meet complex demands, by drawing on and mobilizing psychosocial resources (including skills and attitudes) in a particular context” (OECD 2005, 4). Competence in communication, for example, depends on practical information technology skills and attitudes toward one’s audience, in addition to speaking and writing abilities. 1. The ability to use tools – including language, symbols, texts, knowledge, information, and technology – interactively. Competencies of this sort reflect the need to keep up to date with technologies, to adapt tools to one’s own purposes, and to conduct active dialogue with the world. 2. The ability to interact in heterogeneous groups. These competencies reflect the need to relate well to others, to cooperate and work in teams, and to manage and resolve conflicts. 3. The ability to act autonomously. Such competencies reflect the need to act within the big picture, to form and conduct life plans and personal projects, and to defend and assert rights, interests, limits and needs. A 2012 employer survey concerning the readiness of college graduates for professional careers reinforces DeSeCo’s emphasis on effective communication and the ability to work independently and in groups (Chronicle of Higher Education and Marketplace, 2012). The survey involved 704 human resources personnel, managers, and executives across a spectrum of industries. More than half of respondents reported difficulty finding qualified recent graduates. The perceived difficulty was most acute among 102 Science and Technology employers and smaller companies in general. Science and Technology employers ranked communication skills on par with the technical knowledge associated with those jobs. Across all industries, communication skills, the ability to manage multiple priorities, and decision-making and problem-solving skills were found most wanting. In a similar vein, Schlemper and others (2013) found that geography graduates working in business, government, and non-profit organizations were under-prepared to apply transferrable skills such as project management and communication. Even in the geospatial industry, the so-called “soft skills” may in fact be the hardest to come by. Be important not just for specialists but for all individuals. Yet, despite the truism that “a specialist is a man [sic] who knows more and more about less and less"1, specialist competencies are useful too. Competency models provide guidance to GIS&T educators about what to teach, and to students about what they should expect to know and be able to do. An example of a comprehensive competency specification for the GIS&T field is the U.S. Department of Labor’s Geospatial Technology Competency Model (GTCM). The Department of Labor’s Employment and Training Administration (DOLETA) launched its High Growth Job Training Initiative in 2003. “Geospatial technology” was one of 14 high-growth “sectors” highlighted. In late 2009 and 2010, the DOLETA issued definitions of six new geospatial occupations (National Center for O*NET Development 2009–2010) and the new GTCM (DOLETA 2010). DOLETA commenced its Industry Competency Initiative in 2005. Goals included promoting the development of industry-driven competency models in high-growth, high-demand industries. The contractors that developed the DOLETA’s competency modeling framework defined “competency” as “the capability to apply or use a set of related knowledge, skills, and abilities required to successfully perform ‘critical work functions’ or tasks in a defined work setting” (Ennis 2008, 5). Note the similarity to the DeSeCo project’s definition. Figure 1. Graphic representation of the U.S. Department of Labor's Geospatial Technology Competency Model. DOLETA’s competency model framework comprises six tiers. Tiers consist of one or more building blocks, each of which represents a cluster of competencies. The text version of the model lists specific competencies associated with each block. The tiers of the DOLETA pyramid model progress from - bottom to top - general to specific, not from elementary to advanced. For example, Tiers 1 through 3, called Foundation Competencies, specify general workplace behaviors and knowledge that successful workers in most industries exhibit. These correspond most closely with the DeSeCo Project’s Key Competencies. Included in Tier 1 are the personal attributes or “soft skills” that are essential for most life roles and that generally are learned in the home or community and reinforced at school and in the workplace. Tier 2, the Academic Competencies, include knowledge and abilities learned primarily in school settings. These cognitive functions and thinking styles apply to most industries and occupations. The Workplace Competencies specified in Tier 3 represent motives and traits, as well as interpersonal and self-management styles honed in the workplace. They tend to apply to many industries and occupations (DOLETA 2010). 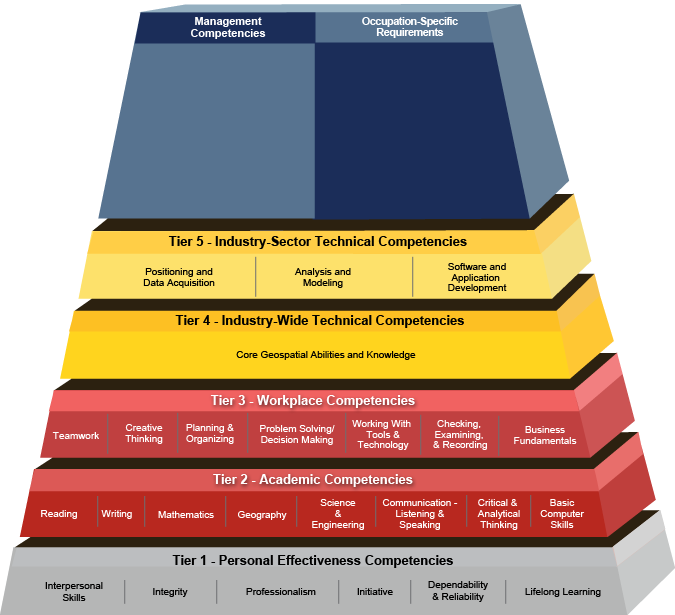 Tiers 4 and 5 (shown in yellow) include the distinctive technical competencies that characterize a given industry and its sectors. Tier 4, the Industry-wide Technical Competencies, lists 43 examples of “Critical Work Functions” that many geospatial professionals are expected to perform during their careers. The Core Geospatial Abilities and Knowledge specified in Tier 4 are exemplary, not exhaustive; geospatial professionals are called on to demonstrate other abilities and knowledge depending on their particular roles, responsibilities, and experience. Few if any workers are called upon to perform every Critical Work Function in any one job. Thus, the examples cited represent both the core competencies of the geospatial field and the diversity of professional practice within it (DOLETA 2010, 15). Tier 5, the Industry Sector Technical Competencies, includes Critical Work Functions and Technical Content Areas required for worker success in each of three industry sectors: (1) Positioning and Geospatial Data Acquisition, (2) Analysis and Modeling, and (3) Software and App Development. The responsibilities of many individual geospatial professionals span two or even three sectors. However, few if any workers are responsible for every work function listed in a given sector. Finally, Tier 6 (shown in two shades of blue) includes two building blocks: occupation-specific competencies and requirements that are specified in the occupation descriptions published at O*NET Online, as well as management competencies represented in URISA’s Geospatial Technology Management Competencies (URISA 2012). The “Geospatial Technology Industry” subsumes several professions and occupations. The scope of competencies required for success in three geospatial professions are depicted below, in relation to the three “Industry Sectors” that make up Tier 5 of the GTCM, and in relation to one another. The diagram illustrates the observation that “the GIS profession's center of mass is analysis and modeling” (DiBiase 2012). Figure 2. Scope of competencies required in three geospatial professions across three industry sectors. © 2012 Esri. Used by permission. Evidence supporting this traditional view of the nature of GIS work abounds in curricula and textbooks. For example, seven of the eleven chapters of Jochen Albrecht’s admirably concise Key Concepts and Techniques in GIS (Albrecht 2007) emphasize analytics and modeling. And the first edition of this GIS&T Body of Knowledge suggests that the scope of GIS professional expertise may be less symmetrical than the diagram above claims: Of 73 units, 26 focus upon analysis and modeling (knowledge areas AM, DM, and GC), twelve on positioning and data (knowledge area GD), and none specifically on software and app development. Mobile technologies, programming (especially with Python), and “Web GIS,” were among the topics identified as missing or under-emphasized in the first BoK by the European GI-N2K (Geographic Information Need to Know) project (Rip, Wallentin and van Lammeren, 2014). Evidence like this, reflective of the ongoing evolution of GIS technology and professional practice, suggest that a rebalancing of the scope of GIS work may be needed. In 2017 Esri conducted a survey of its Young Professionals Network (YPN) about the impact upon GIS work of the ongoing evolution of GIS from a desktop-centric, file-based software product to a web-centric, services-oriented platform that’s increasingly integrated with mainstream information technology. The survey asked YPN members – most of whom are recent college or university graduates – how well prepared they felt to compete for “good jobs involving geospatial technologies.” Their 226 responses suggest a perceived gap between what graduates learned in higher education and what they feel they should have learned. At the heart of the survey were three questions that asked YPNs to assess themselves against competencies specified in the GTCM. For each of the three Industry Sectors (Positioning and Data Acquisition, Analysis and Modeling, and Software and App development), Esri asked respondents to rate themselves on five sample competencies. For each competency, respondents could choose “This topic doesn’t apply to me,” or “I didn’t know anything about this,” or “I didn’t know enough about this,” or “I understood this topic well.” Responses suggest that competencies in all three Industry Sectors are relevant to modern GIS work. Few respondents indicated that any of the three Sectors “doesn’t apply to me.” Moreover, unlike the Positioning and Data Acquisition and Analysis and Modeling sectors, a preponderance of respondents indicated that they “didn’t know anything about” the Software and App Development competencies. In fact, the difference between the three distributions of responses is highly statistically significant (Kolmogorov-Smirnov test, p = 0.00000009 and 0.00000002). The difference suggests a gap in graduates’ preparation in the knowledge and skills needed to be makers, rather than just users, of geospatial technologies (DiBiase 2017). Open-ended responses to the survey bolster the argument that modern GIS&T education needs to span all three sectors of the GTCM. Laudably, this new and revised digital version of the GIS&T Body of Knowledge includes a new knowledge area on Programming and Development. Current students of GIS&T in higher education will soon commence careers that will last 30 years or more. The career landscape they enter is subject to much speculation and some dire predictions about the future of traditional professions. Thought leaders concerned with the impacts of a “Second Machine Age” (Brynjolfsson and McAfee 2014) or a “Fourth Industrial Revolution” (Schwab 2017) worry that many of today’s occupations may not be sustainable. In a widely cited research article, economist Carl Benedikt Frey and machine learning researcher Michael Osborne (2017) estimate that 47% of U.S. workers are at risk of “technological unemployment.” Of the 702 occupations Frey and Osborne analyzed, one of the most susceptible was Surveying and Mapping Technicians. Frey and Osborne calculated a 96% probability that workers in that occupation will be displaced by automation in the coming decade or two. Although Frey’s and Osborne’s research has its critics, their prognosis is generally consistent with a body of research by economists, tech leaders, and forward-looking historians who anticipate fundamental disruption of traditional employment by increasingly capable machines. What does this mean for GIS work? Innovation expert Alec Ross (2016) observes that through history, “our most valued commodities have gone from salt and sugar, to chemicals and fuels, to data and services.” Human analysts and their employers, Ross and others foresee, will rely increasingly on machine learning and artificial intelligence to cope with the data deluge. Meanwhile, management consultants Richard and Daniel Susskind, authors of The Future of the Professions (2016), foresee that “In the long run, increasingly capable machines will transform the work of professionals … leaving most … to be replaced by less expert people and high-performing systems.” In a sassy rebuttal to predictions of a “robopacalyse,” Surowiecki (2017) reminds us that the outsourcing of work to machines is not new, and that observers are notoriously bad at anticipating the new jobs that disruptive technologies eventually create. The Susskinds recognize this, and don’t predict future occupations that may replace the traditional professions. Instead, they do suggest twelve future cross-cutting roles that education should help people prepare for. Like life, competence in GIS&T knowledge work is a journey, not a destination. Competency models need to be updated as technologies evolve and new use cases emerge, and others recede. First published in 2010, the GTCM was updated in 2014 and 2018 through a community review process organized by the National Geospatial Technology Center of Excellence (GeoTech Center). Confronted with ceaseless change, learning is a way of life for GIS&T workers. Schlemper and colleagues (2013, 491) conclude that “professional development opportunities, when supported by employers, are effective strategies to enhance interpersonal interactions, facilitate work on specific projects, and expand employees knowledge and skills.” It’s no accident that “Lifelong Learning” is an enduring cornerstone competency of the GTCM. Although competency models provide useful guidance to educators about educational objectives, they may even more useful as roadmaps to help current and aspiring GIS&T knowledge workers make the most of their journeys. For example, students may be asked to candidly self-assess their current geospatial competencies, as well as their “competencies for life,” and to discuss strategies for cultivating those abilities further as their careers and lives unfold. Portions of this entry were adapted from DiBiase, D., Tripp Corbin, Thomas Fox, Joe Francica, Kass Green, Janet Jackson, Gary Jeffress, Brian Jones, Brent Jones, Jeremy Mennis, Karen Schuckman, Cy Smith, and Jan Van Sickle (2010). The New Geospatial Technology Competency Model: Bringing Workforce Needs into Focus. URISA Journal 22:2, 55-72 [PDF file]. Albrecht, J. (2007). Key Concepts and Techniques in GIS. SAGE Publications. Pre-publication version available here. DiBiase, D. (2012). Strengthening the GIS Profession. ArcNews 34:2, Summer, 1, 4-5. DiBiase, D. (2017). GIS Graduates Want More Coding, App Building, IT. Ennis, M. R. (2008). Competency models: A review of the literature and the role of the employment and training administration (ETA) [PDF file]. DOLETA (U.S. Department of Labor Education and Training Administration, 2010). Geospatial technology competency model. National Center for O*NET Development. O*NET online. OECD (2001). Definition and Selection of Competencies: Theoretical and Conceptual Foundations (DeSeCo) – Background Paper [PDF file]. OECD (2005). The Definition and Selection of Key Competencies – Executive Summary [PDF file]. Ross, A. J. (2016). The industries of the future. Simon & Schuster. Rychen, Dominique S. and Laura H. Salganik, Eds. (2003). Key Competencies for a Successful Life and Well-Functioning Society. Hogrefe & Huber. Schwab, Klaus (2017). The fourth industrial revolution. Crown Business. Surowiecki, James (2017). Robopocalypse Not. WIRED Magazine, September, pp. 60-65. Susskind, Richard, and David Susskind (2005). The future of the professions. Oxford University Press. The Chronicle of Higher Education and American Public Media’s Marketplace (2012). The Role of Higher Education in Career Development: Employer Perceptions [PDF file]. Urban and Regional Information Systems Association (URISA, 2012). Geospatial Management Competency Model. Explain how the DeSeCo program’s three categories of individual competencies – the ability to use tools, the ability to interact win heterogeneous groups, and the ability to act autonomously – relate to professional practice in the geospatial field. Explain the relationship of major geospatial professions to the three industry sectors of the U.S. Department of Labor’s Geospatial Technology Competency Model (GTCM). Self-assess your competencies relative to the Geospatial Technology Competency Model. Discuss the evolution of GIS knowledge work in an age of increasingly capable machines. Self-assess your geospatial competencies relative to Tier 4 of the Geospatial Technology Competency Model using the GTCM Self Assessment form at https://dibiase.wufoo.com/forms/s1qey6pq10ngqy3/. Which are your areas of strength and relative weakness? Outline a professional development roadmap to address your weaknesses and maintain your strengths. Identify competencies that you think should be added or removed from Tier 4.